In our body's head, the Brain, the most anterior, most highly developed portion of our central nervous system (CNS) is contained within the neurocranium (cranial vault). In our body's head, the Brain is divided into three basic parts: the cerebrum, the cerebellum, and the brain stem. In our body's brain, the Brain Tissue is pinkish on the outside and mostly white on the inside, with slight variations in color. In our body, the Brain is surrounded by a system of connective tissue membranes called meninges that separate our skull from the brain. In our body's brain, the Hippocampus, a curved elevation of gray matter extending the entire length of the floor of the temporal horn of each lateral ventricle, is a paired structure, with mirror-image halves in the left and right sides of the brain. In our body's brain, the Hippocampus, located inside the medial temporal lobe, beneath the cortical surface, belongs to the limbic system and plays a crucial role in learning, spatial navigation and in processing various forms of information such as long-term memory. In the body's brain, the Limbic System is a set structures including the hippocampus, amygdala, anterior thalamic nuclei, and limbic cortex, which support a variety of functions including emotion, behavior, short term memory, and olfaction. 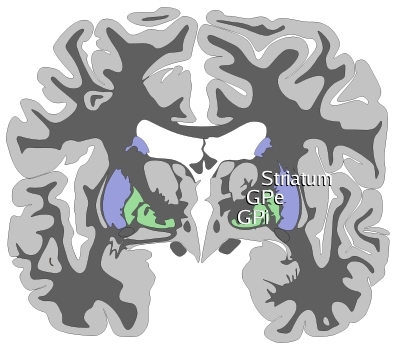 In the body's brain, the Limbic System, defined both functionally and anatomically, as the primitive brain part, implicated in the higher integration of visceral, olfactory, and somatic information as well as homeostatic responses including fundamental survival behaviors and past experience and feeling association. In our body's brain, Cerebrospinal Fluid is a clear, colorless transcellular body fluid, that occupies the subarachnoid space and the ventricular system around and inside the brain and spinal cord. In our body's brain, Cerebrospinal Fluid (CSF) circulates around the brain and spinal cord, which cushions, cleanses, and brings nutrients to the cells in the brain and spine. CSF is produced in small, hollow spaces within the brain called ventricles. Excess CSF normally drains away into the bloodstream as fresh CSF is produced. In our body's brain, the Cerebrospinal Fluid (CSF) flows continually from the interior cavities in the brain (ventricles) to the thin subarachnoid space, just beneath the meninges, that surrounds the brain and spinal cord. About one pint of this clear fluid is produced per day and is absorbed by the blood stream. Balances the amount of blood in the head. Bathes and protects the brain and spinal cord. Carries nutrients between the brain and spinal cord while removing waste. Normal flow and absorption through the subarachnoid space is dependent on proper CSF pressure in the head (called intracranial pressure). In our body's central nervous system surrounding the brain and spinal cord, the Meninges are a triple layered membrane system consisting of thin protective membranous coverings of connective tissue that covers the brain and spinal cord, within the dorsal cavity it suspends the brain within the skull (cranium) preventing the brain from pressing against the skull's inner surface. In our body's head and the spinal cord, the Meninges is a laminated, or layered, structure that covers and protects the brain and the spinal cord. The outermost layer is the fibrous membrane dura mater, the middle layer, arachnoid (arachnoid mater) secures the dura to the innermost layer, the pia mater. In our body's head, the brain swims in three membranes. The first outer layer of the brain is the �Dura Mater�. The next layer is the �Arachnoid Membrane� , called the arachnoid because of it's spider web appearance where cereal spinal fluid flows (the blood of the brain that is basically protein) so neurons can flow from the brain to the spinal cord which also gets blood into the brain through the sub arachnoid space as well as paths to cranial nerves. The �Pia Mater� is the root of the nervous system, which supplies the brain with blood and connects via the arachnoid trabecula. In our body, the Meninges, as a membrane system, lines the insides of the bones protecting both the brain and spinal cord from physical impact, with a protective padding and containment of the cerebrospinal fluid (CSF) in which the central nervous system floats. In our body's brain, the Basal Ganglia (Basal Nuclei) is topographically located deep within the cerebral hemispheres in the cerebrum (telencephalon) region of the brain. In our body's brain, the Basal Ganglia (Basal Nuclei), a corpus striatum component, are a group of sub-cortical nuclei, and are composed of the Striatum (Neostriatum), Globus Pallidus (Pallidum, Paleostriatum), Subthalamic Nucleus (STN) in the (Subthalamus), and substantia nigra (SN). In our body's brain, the Basal Ganglia (Basal Nuclei) functions include; controls cognition, movement coordination and voluntary movement. 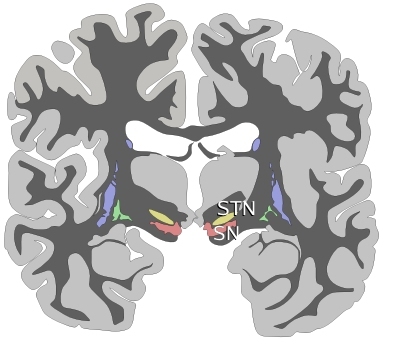 In our body's central nervous system, the Substantia nigra (SN) is a brain (and brainstem) structure located in the midbrain (mesencephalon) that plays an important role in reward, addiction, and movement. Substantia nigra is Latin for "black substance", as parts of the substantia nigra appear darker than neighboring areas due to high levels of neuromelanin in dopaminergic neurons. 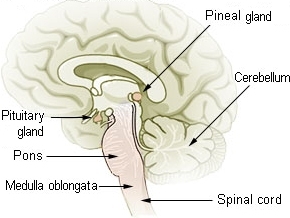 In our body's ventral midbrain, the Substantia Nigra is part of the basal ganglia (basal nuclei); the other parts of the basal ganglia include the striatum (caudate nucleus, putamen, and nucleus accumbens), globus pallidus (paleostriatum), and subthalamic nucleus. The black substance of the Substantia Nigra are the cells that produce the important neurotransmitter dopamine, the dark color being a by-product of the dopamine synthesis. In our body's brain and continuous with the central spinal canal, the Cerebral Ventricles (Ventricular System) are a set of structures containing cerebrospinal fluid (CSF) in the brain and the connecting foraminae. Ventricles is a series of interconnected, fluid-filled cavities are found within the brain. These cavities are the ventricles of the brain, and the fluid is cerebrospinal fluid (CSF). In our body's, Brain the <Ventricular System comprises four cerebral ventricles: the paired lateral ventricles (right and left lateral ventricles), and the midline third ventricle (ventriculus tertius) and the fourth ventricle, each containing a CSF producing choroid plexus. In our body's brain, a Sulcus (pl. Sulci) is one of the prominent grooves on the surface of the brain best described as a depression or fissure in the surface, forming a furrow that borders or surrounds the gyrus (gyri). In our body's brain, Sulcus surrounds the cerebral cortex gyri, creating the characteristic ripple appearance. In our body's brain, Brain Fissures are the naturally occurring fissures in the brain. In our body, the Brain Fissures some recognizable fissures include the collateral fissure. In our body's brain, a Gyrus (pl. gyri) is a ridge on the cerebral cortex. In our body's brain, the Gyrus of the cerebral cortex is generally surrounded by one or more sulci (sulcus) creating the characteristic ripple appearance of the brain. In our body's central nervous system, the Brainstem (Brain Stem) is the portion of the brain that is continuous with the spinal cord and consists of the medulla oblongata and pons of the hindbrain and midbrain (mesencephalon). In our body's brain, the Hypothalamus, part of the limbic system, is about the size of an almond located in the region of the brain beneath the thalamus, just above the brain stem, forming the ventral part of the diencephalon (interbrain). In our body's brain, the Hypothalamus is a structure composed of distinct nuclei and less anatomically distinct areas. In our body, the Abdomen Brain is a mostly autonomous part of enteric nervous system (ENS) that reside mostly inside the walls of the digestive system and collectively contain as many neurons as the entire spinal chord The Abdomen Brain control the functions of the digestive system and functions both independent and dependent with the Cranial Brain activity. The Abdomen Brain mediates the neuronal and hormonal responses (Regulators) that control the digestive system and functions both independent and dependent with the Cranial Brain activity. In our body, the Abdomen Brain uses neurotransmitter regulators, such as acetylcholine, dopamine, and serotonin. These regulators are produced and released by cells in the mucosa layers and stimulate the secretion of digestive juices, cause gland and organ secretions and movements, and the timely rhythmic peristaltic wave. It is this brain that initiates the appetite hormonal signals to increase and decrease are desire to eat, both the quantity and selection criteria. In our body's, brain, the Pineal Gland (Epiphysis Cerebri), aka the Pineal Body, part of the limbic system, is a light-sensitive neuroendocrine small cone-shaped structure that attaches to the roof of the third ventricle extends posteriorly that secretes melatonin (n-acetyl-5-methoxytryptamine), other biogenic amines, and neuropeptides. In our body, the Pineal Gland (Pineal Body), is in the neurosecretory systems and consists of portions of neurons, neuroglial cells, and specialized secretory cells called pinealocytes. The pinealocytes synthesize the hormone melatonin (n-acetyl-5-methoxytryptamine) and secretes it directly into the cerebrospinal fluid, which takes it into the blood. Melatonin affects reproductive development and daily physiologic cycles.